My one and only show of the year, and terrible timing too! In so far as I leave the country again in little more than a month. 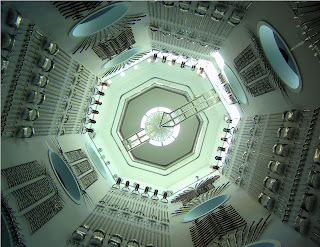 Still even if the show isn't needing a visit, it does have possibly the best venue of any wargaming show - the Royal Armouries in Leeds. You could easily spend all day exploring the displays at the Royal Armouries, and my visit for Fiasco also allowed me the opportunity to catch the Weta armouries exhibition, featuring amazing weapons and armour from the Lord of the Rings movies, The Chronicles of Narnia (if you like that sort of thing) King Kong and others. Just the techniques involved in making the real weapons and the props were fascinating, but seeing things like Sting and The Sauron's armour in the flesh was great. As for the show itself; well a much smaller affair than recent year, and with no Bring and Buy at all! Why the club didn't organise their own is beyond me, but with the space available it'd been a squeeze to say the least. A few notable absentees in the traders too, no Irregular Miniatures for example. But thankfully there were a number of great games on to provide some nice eye candy. 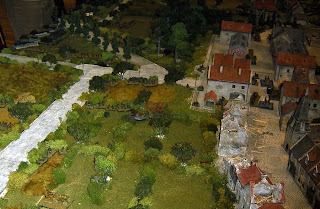 Here, the Battle of Ravenna in 25/28mm. 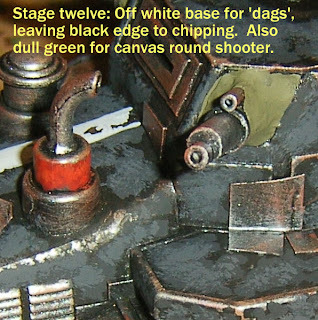 Very tidy painting, but somewhat unispired (presumably historically accurate) terrain. Another set of 15mm WW2 rules entered the fray, with a scenic table. On close inspection the figures were more of a let down., but you can't have everything now, can you? 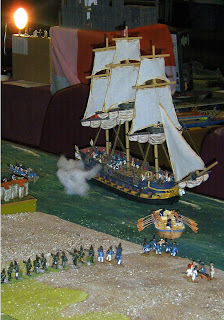 A gorgeous 28mm ship of the line bombards a fortress in what I presume was a Napoleonic game of some sort. 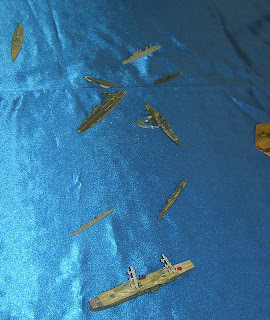 I never got any details, but the model ships were fantastic! Gladly I bumped into a variety of the local gamers and my old opponent, Chris, giving me the opportunity to arrange a last game with him before I depart again. As for shopping, well, What I would've really wanted - A copy of Victory at Sea and its' supplement seemed to be the only thing not for sale anywhere. Otherwise I caved in on the lush Perry plastics, and picked up a box each of the American Civil War models. 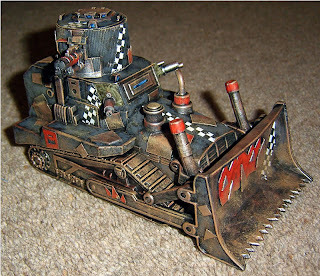 The only other purchase being 10 Halberdiers to add to the Dogs of War. All in all 58 miniatures for £26. Great, if only I could justify them! 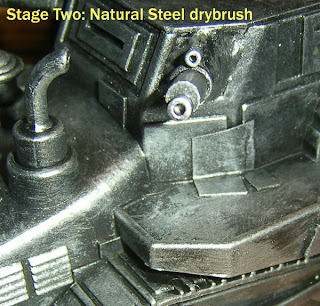 Ah well, I'm sure by this time next year they'll be painted; and quite possibly sold. Such is the wargamers lot. 1943, and as the war in the east slowly begins to turn, a British fleet attempted to intercept the Japanese Carrier Akagi on a run to port. 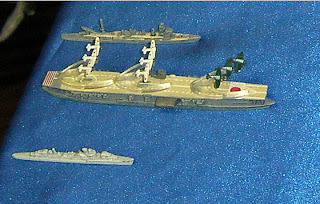 The Akagi, fat with aircraft was accompanied by light cruiser Jintsu, and a single destroyer. Running a few miles to the north were the Battlecruiser Kongo and the heavy cruiser Myoko. 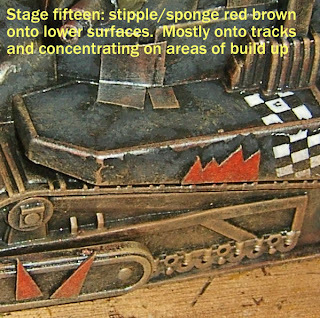 Picket duties were being maintained in this sector by a I-19 class submarine. In response, the British assembled a force centred round HMS Rodney and Carrier HMS Illustrious. A pair of Australian cruisers and two destroyers were seconded to the operation, in the hope of stopping the Japanese reaching safe waters. A British submarine was also rushed independently to the area. In the engagement the Japanese were split by a pair of small Islands 10 miles east of Belang. The Royal Navy was able to initially engage the smaller but powerful Japanese battlecruiser group. However air attacks by the Japanese fighters based on the Akagi effectively neutralised the British air power. Nonetheless by 11.45 hrs the Japanese had already lost most of their offensive air ability in an unsuccessful strike on the British carrier group. Though their submarine picket managed to Torpedo the Illustrious. By this stage the Rodney was beginning to make its' impressive main battery tell, with a firepower the Kongo and Myoko were unable to match. However the engagement had now descended to one of a close quarters assault, as the Japanese attempted to use their 'Long Lance' torpedoes to sink the British carrier and its' escorts, whilst screening their own. The Kongo, Myoko and Jintsu were lost, but the combined efforts of these vessels, the I-19 submarine and desperate surface attacks by Japanese fighters were enough to sink the Illustrious, and allow the Akagi to escape. Although the Royal Navy could count control of sea lanes and the destruction of several key enemy assets in its' favour, the loss of its' own carrier and the escape of the enemy's resulted in Belang-Alasan being considered a Pyrrhic victory at best. It would be some time still until the mighty Akagi was sunk, but for now all it could do was slink back to port, unescorted. 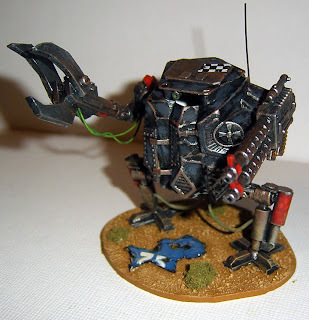 I hereby swear, this will be the last Sci Fi/Fantasy army I start for a long, long time. This year has been a big one for fantasy games of on sort or another for me. But I'm glutted on them now and really need to return to some more historical gaming. Still in the current phase, I have as mentioned yesterday made a start on painting my recent accumulation of 40 figures. 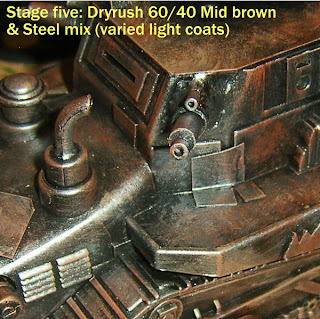 The image below presents the initial 400 point plus combat patrol army. 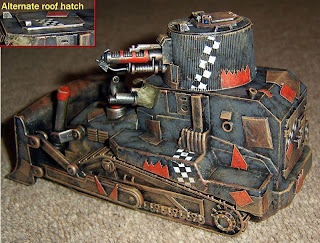 The core of this is 20 Ork boys, straight out the Assault on Black Reach box, and given a straight forward paint job. Doc Greenthumb (bonus points for the musical reference folks) the Orc Painboy and his loyal orderly. Bought full price (gasp) from GW. Reasonably happy with what is a quickie paint job for a character figure. 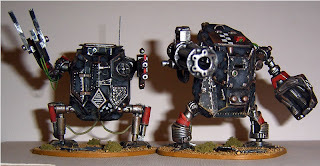 Then there are the Nobs, from the same source as the boys. 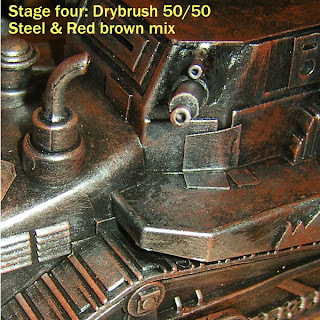 The paint job here adds a wash of the GW Mud wash mixed with Red wash. A couple of slight weapon reposes were added. Great models with plenty of variety. I've really honed the chipped paint technique on these guys, a full tutorial is to follow soon. Overall I think these look great on the table, and the models are fantastic considering the come as part of a starter set. 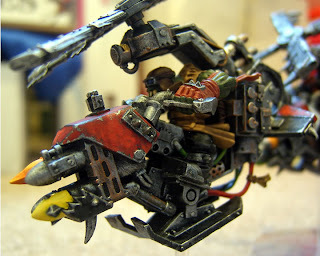 A Ork wartrakk, cobbled together from one of the Robogear models released (unsuccessfully) by Airfix a few years ago. I picked up a couple of kits for £3 each; they even came with Humbrol acrylics (good for undercoating but not much else). 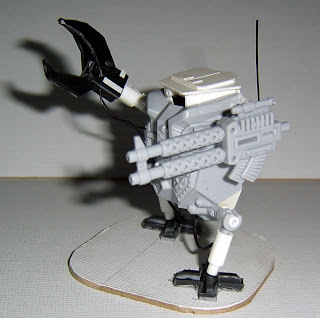 This one needed a substantial rebuild of the running gear, and a new weapon, also from Robogear parts. The crewman is an otherwise unemployable plastic Orc archer. 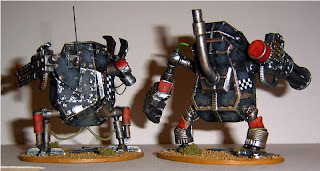 Lastly for today, Robogear and the bits box is also providing some Killer Kans (mini combat walkers). This is the first one, though there's work to do on it. 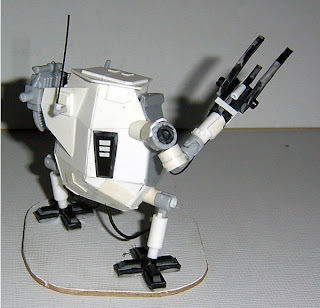 Best of all, to my mind, there are enough parts left from the one kit to make another of these. 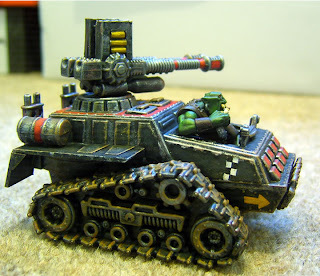 So, about £70 will eventually supply around 1000-1200 points of Orks; an army on its own, or a large reinforcement to my old army. 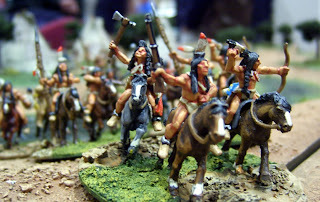 But as thoughts turn to the winter, I wondering what to do next, and influenced by the new 28mm Plastics, I'd have to say I'm leaning toward the horse and musket era for something new. Let's just see though, it might be 6 months before anything comes of it. 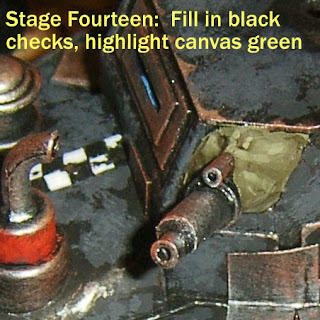 The latest thing at the Leeds NightOwls is another mini campaign, this time set in the 40k universe. The star system Sodallere finds itself at the end point of a rift in warp space and the sudden arrival of unexpected guests sees sudden and explosive action amongst several alien races. 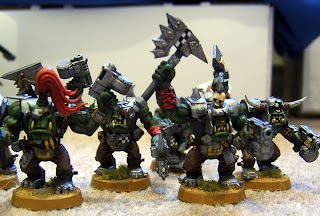 I quickly painted up my new Orks to get involved, more on those in a subsequent post, and have set to getting a decent number of games in before either the end of the campaign, or my time in the area! And overall it's been going surprisingly well. 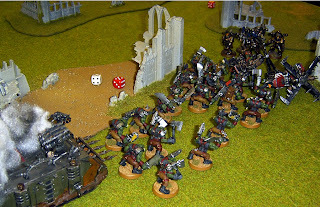 The games are combat patrol sized, which means a maximum of 400 points and a variety of restrictions on unit types. 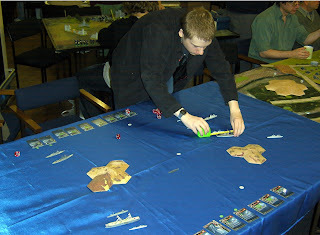 On the plus side a game should never last more than an hour, so several can be played in a session; or around a more conventional game. 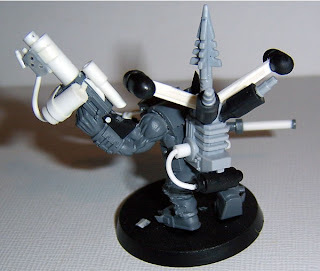 5 Nobz, wearing 'eavy armour. Lead by Fangback the Ork, accompanied by Doc Greenthumb the painboy. 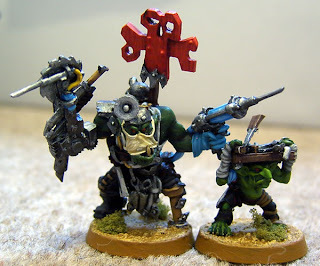 20 Ork Boyz with two 'eavy shootas. 2 Deffcopters with twin linked Rokkit launchers. So far this little force has won 5 and lost only 1, and that was against an all long ranged shooty space marine force. Otherwise we've been victorious over Tyranid, Chaos Marines, Tau, Adeptus Arbites (imperial police) and Guard forces! A narrative acount of one of these battles should serve to illustrate the point! Whilst Fangback was notionally in command when it came to brains, Doc Greenthumb usually held sway. "Them's look like marinez over there, but dey is all spikey like." 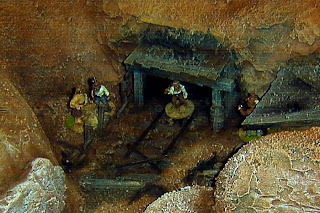 Fangback motioned over the ruins of a small village towards a handful of glinting figures. "Whaddya fink." Greenthumb Scratched his masked nose. "I reckon the plan last time woz sound, just need to keep tha boyz 'eads down more until it's clobberin time." Greenthumb knew how to keep the group of Nobs motivated, a smouldering blue liquid was injected into each ones' arm before the battle, sending pulsating spasms of raw energy through their limbs. Fangback ordered the smaller boyz to advance through the centre of the village whilst Deffcopters looked for targets of opportunity. To their bemusement the enemy didn't spray them with a hail of explosive bullets. 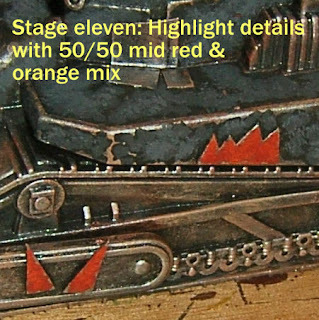 Instead a curiously emblazoned Rhino rumbled forward, unleashing gouts of black smoke and a group of red warriors. "I've seen thems before," yelled one of the lesser nobs "thems Beserkers; this'll be a proper fight. 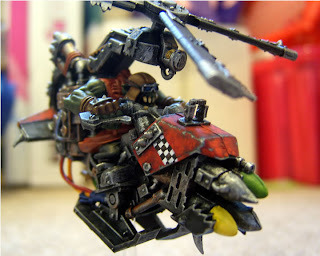 Waaagh!" In rushed the Nobs, Greenthumb barely able to keep pace. The Nobs hit hard but the Chaos warriors held firm, despite the fresh sheen of their own blood across their armour. 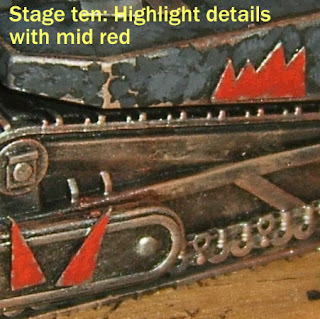 Behind the scrap, the unloaded Rhino tried to tangle with the Ork boys. They allowed it through their lines though, crawling all over it; gibbering and screaming as they set to it with Axes, Chainswords, Bolt pistols and Grenades. 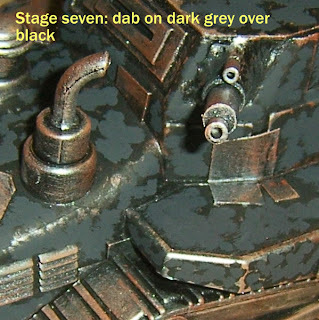 The Rhino finally lifted up on one side as the suspension was rent from its hull and before long the remains were burning; thick with the acrid smell of the crew, boiling alive in their armour. 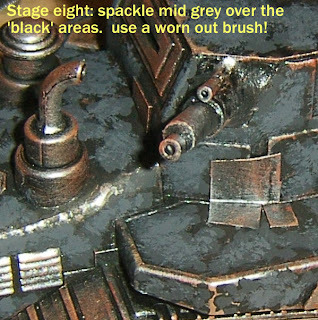 Things weren't going all their own way for the Orks though, and Greenthumb glanced away from his own favourable scrap to see a Deffcopter spiralling into the ground. 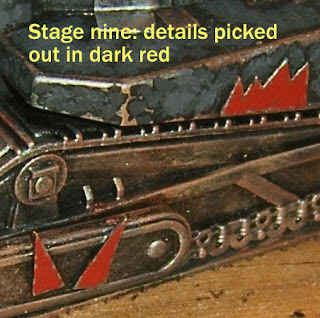 The Nobs were oblivious to it, and the Boyz seemed only interested in the burning tank. 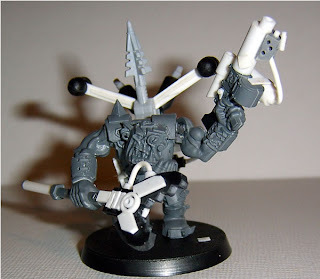 "Oy, grots for brains," he yelled, waving his syringe in the direction of the other Chaos warriors trying to encircle his lads. "There's your fight!" The Boyz swung around and screamed with joy; a half dozen warriors had left themselves exposed in their efforts to bring down the copters, they'd broke cover. Some screamed revenge for their fallen flyboyz, others simply relished another battle. They charged and scrambled over the wreckage toward the near helpless foe. It was over so quickly, that as the last Chaos warrior fell their only casualty was a fool who attempted to leap at the warriors without paying heed to the remains of the rotors, spinning in front of his - soon to be decapitated - head. At last the final Beserker fell too, their toll on the Nobs was significant, but not severe. Fangback roared with unconcealed relish whilst Greenthumbs Grot, Randi, scampered around trying to fix up the wounds - generally getting a swatting for his troubles. The Nobs wandered over to the Boyz, who were busy firing Plasma guns at each other and wondering why their enemy hadn't bothered to use them. "Gimme that!" rumbled Fangback. 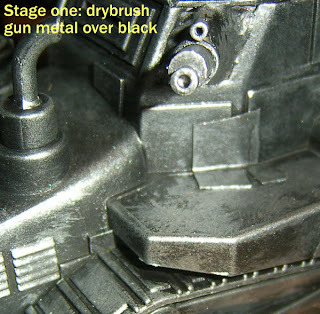 He turned the gun on the burning Rhino, and carved a neat hole through it's front armour. 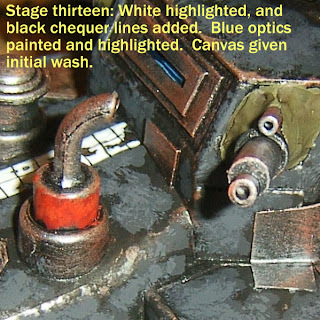 "Hmmm, good work lads, Wrenchmangler will be well 'appy with this lot." Greenthumb looked over the injured, not many really, and only two actually dead. Pity; he needed more to work with than that. Still, these 'spiky humies' would make for some effective transplants. Or failing that, a tasty dinner. Last addition to the Dogs for now. Well unless something changes to give me time to do the unit of Pikemen I have waiting attention some day. This is Klaus Von Mettwurst; who'll serve as Army General in larger games. 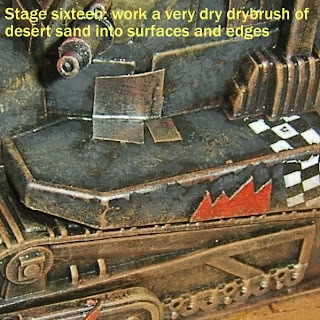 I wanted to introduce something unique and fantastic to the army, to give it a blatant fantasy aspect. 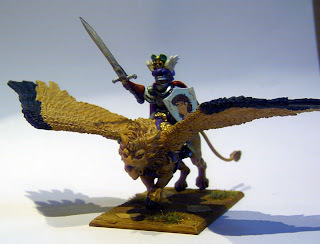 The army list allows for certain characters to be mounted on a Pegasus, so that seemed a reasonable starting point. However, I quite fancied something a little rarer. 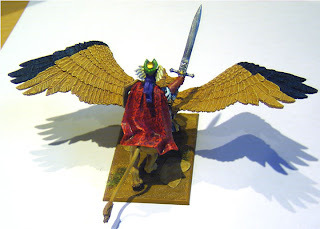 So a quick eBay purchase supplied some wings, and a forum associate did a trade on a model lion from the Elven Chariot kit. 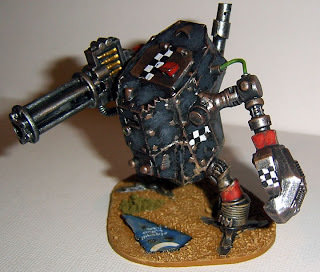 The rider was already in my supply of knights bought in the first round of the army assembly, and is I think the current Empire General model. 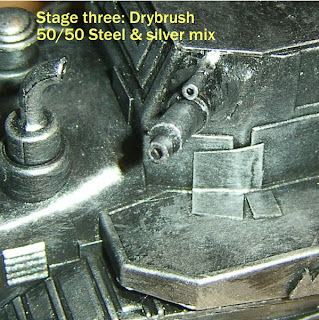 As it was marrying white metal wings to a plastic body, the creation of this model was always going to be difficult; much hacking and carving later and the wings slotted in to the body. 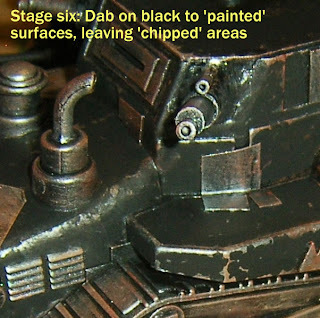 The saddle and wing joints were made of modelling putty, in such a way as the joins were all covered and the general didn't need gluing to the model to sit securely in place. At first the model was pinned to a rock, but the balance was never right and eventually it pitched itself off my modelling 'table' on to the floor and broke off the base. Hence the rather simple and low flying base it now has. The photo's don't do justice to the details in places, but it's not my best work, and frankly I was glad to see the back of it! Another day another game; well, it'd make sense in a gaming blog wouldn't it. I took my Orc & Goblin army out for a session, as I'd been forced to pull it out of one storage site to transfer it to another, I figured I ought at least to use it at some stage in between. On the day though the only other Fantasy player in the club with 2000 points to play with was another O&G player. So it was going to be a civil war! My army was light on characters and special troops and so numbered about 200 figures, Loosely speaking three large blocks of Orcs, A smaller unit of Savage orcs, two skirmish lines of goblin bowmen, a mass of Goblin spears, Spider Riders, Wolf Riders, a Ballista, a Doom Diver catapult and some modest heroes and wizards. 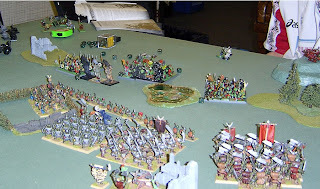 His was the opposite, focusing on some powerful characters (one was worth the same as all four of mine) and several war machines; and even with two large units of goblins, was little over half the size of mine. The battle progressed well for me, with my centre marching hard behind screens of goblin bowmen, whilst my cavalry outmanoeuvred his. 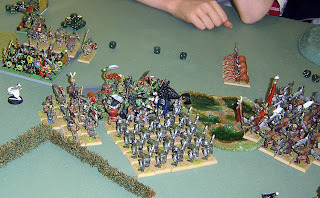 Though we suffered a slight reverse on the left when first the goblin bowmen and then the unit of 36 spears backing them up fled, the attacking Spider riders, Pump wagon and Chariot were effectively out of the battle as a result of the delay these caused. In the centre his trolls came up against frenzied Savage Orcs in the field and were thouroughly beaten; at about the same time , I successfully got of the incredible "Gorks Warpath" spell, and gave four of his units a good kicking with it. At the back my wolf riders wiped out all his artillery before turning on the rear of his goblins, My warboss too was busy killing outclassed gobbo's, and as a result on the last turn his only Orc unit was charged on two sides, with two units moving up to help finish him off. Unsurprisingly they were destroyed! 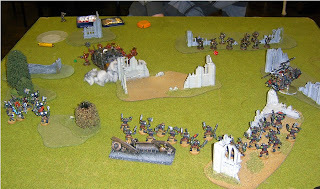 A great and solid victory, showing that a no frills army can win in Warhammer against a gimmicky tooled up one. This was a victory for better generalship, something I certainly don't always manage! But it does mark the start of a much better run of luck on the table for me. Some may recall this time last year I was in the midst of a three month victory drought. No such problems at the moment, as future posts will reveal!